At one point in the late '70s, Kenner had plans to release "fashion outfits" for use with their Luke and Leia large size figures. Unfortunately, none of these outfits was ever released. 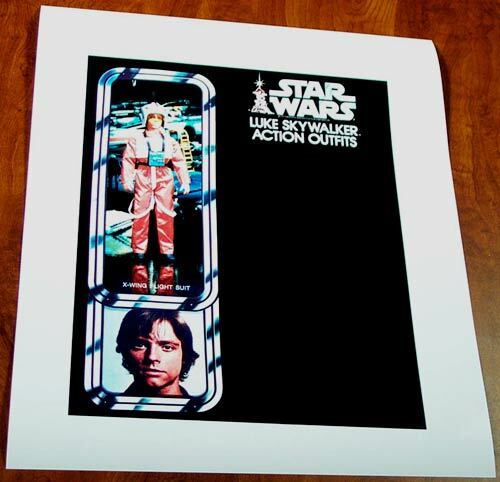 But Kenner did develop packaging for the items. Like the the outfits for the company's similarly scaled Six Million Dollar Man figures, the Star Wars fashion outfits were planned to be packaged on colorful blister cards. Each card was to be decorated with both a photo of the character's head and another of the outfit as it would look on the figure. As you've no doubt noticed, this particular piece represents the proposed blister card design for the Luke figure's X-Wing Flight Suit. This piece is what is known as a comp. Basically, it's the imagery planned to be used on the blister card, printed in color on a piece of paper. When the time came to make prototypes of the outfit packages, for photography or display purposes, the color portions of this sheet could be cut out and glued to a generic backer card. So far, no cardboard "proofs" of this item have been discovered. It should be noted that this represents a preliminary design. It includes no Kenner logo, no product number and the Star Wars logo includes 1977 copyright text. A prototype of the Luke X-Wing large size figure outfit can be viewed here.